Why is a fragment more fascinating than a well-preserved object? 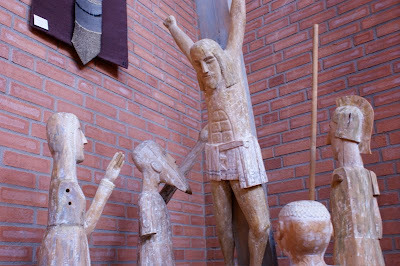 Here is the sculpture "Passionsgruppen" by Octavian Pirvan in St. Eskil's Church. The sculptor explains that he has become fascinated by old sculptures made with simple means by people living closer to nature. A missing arm in the sculpture is a possibility, he argues. We can imagine it the way we want to. Moving, perhaps? Good question. I can't remember seeing that sculpture, I will have to go back and look for it. I found it upstairs. Well worth taking a second look, methinks.